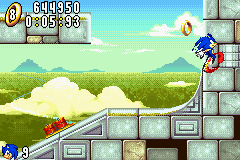 GBA Sonic Advance (USA) "Sonic, no Ultraspindash" in 13:17.22 by Mukki. In this run of Sonic Advance, the author doesn't take advantage of the game-destroying spindash glitch featured in the normal run. It goes somewhat slower because of this, but new inventive solutions are used to get through each act, and the result is still much faster than any oversized ferret ought to be moving.